Ground faults can be dangerous. A short to ground in a solidly-grounded system creates large currents that can damage equipment and cause a shutdown. A ground fault can also create an arc flash, which can cause serious injury to nearby personnel as well as damage to equipment. The danger of arc flash is the reason that electrical cabinets must bear warning labels, and anyone working on an energized panel must wear the proper personal protective equipment (PPE). On top of that, an arc flash may not draw enough current to rapidly trip an overcurrent protective device. One way to reduce or eliminate many ground-fault problems, including most arc-flash incidents, is to use a high-resistance-grounded system, in which the neutral point of the transformer (either the X0 of a wye connected transformer or generator, or the artificial neutral of a zigzag transformer) is connected to ground through a neutral-grounding resistor, as shown in Fig. 1. The neutral-grounding resistor will limit ground-fault current to a small value and, in many cases, will allow the system to continue operating. And by eliminating phase-to-ground faults a high-resistance-grounded system eliminates 95 percent of all arc-flash hazards. High-resistance-grounded systems have been required in mines for a long time. Even though high-resistance-grounding offers great benefits in improving safety, there are some important things to consider, including a number of factors that can make it difficult to detect low-level ground faults. Several of these are exacerbated by the use of frequency inverters. This paper will explain some aspects of how high-resistance-grounded systems work, examine the various challenges with monitoring ground faults in high-resistance-grounded systems, and show how technology can resolve those challenges. Since a high-resistance-grounded system prevents a ground fault from causing an overcurrent trip, there must be a way to detect when a ground fault has occurred. The best way to sense ground faults in a grounded system is to use current-sensing ground-fault relays, which use core-balanced zero-sequence current transformers to detect currents flowing where they should not. This permits selective coordination and makes it easy to find a ground fault. Any window-type current transformer becomes a core balance zero-sequence current transformer when all current-carrying conductors are passed through the current transformer window. If there is no ground fault, the output from the current transformer should be zero. If there is a ground fault, the currents will not add to zero, and the difference can be detected and used to signal an alarm, or trip the faulted section. A number of factors can limit the ability to measure low-level ground-fault currents. These include system capacitance, unbalanced single-phase loads, current-sensor limitations, low-frequency operation, harmonic components, and frequency inverter carrier frequency. All electrical systems have phase-to-ground capacitance. While in reality this capacitance is distributed throughout the system it is usually modeled as "lumped" values, as shown in Fig. 2. On a grounded system, if the capacitances on all three phases are equal, a core-balance current transformer on the three phases together will read zero, but if the capacitances or phase-to-ground voltage are unequal, the current transformer will have a nonzero output. This can cause nuisance tripping unless the trip threshold is increased, but this reduces the ability to detect low-level ground faults. This largely explains why people protection levels are not possible in industrial systems. When one phase of an ungrounded system is shorted to ground, current will flow through the capacitance to ground of the other two phases, as shown in Fig. 3. Note: A core-balance current transformer at "1" will measure the charging current, while a core-balance current transformer at "2" will measure zero. This charging current may be large enough to cause a ground fault relay to operate on an unfaulted feeder. To avoid this so-called sympathetic tripping, the protection on those feeders must be set above the level of charging current; if sympathetic operation is acceptable, the protection level may be set lower. If the line-to-neutral voltages of the three phases are not equal, the currents through the capacitances of the phases will be unequal, resulting in steady-state zero-sequence current. This sort of voltage unbalance may be the result of unbalanced single-phase utility loads. The affects are usually small, but may affect low-level ground-fault current detection. It's worth noting that, in the absence of leakage to ground, unbalanced load currents will not cause a ground fault trip, because the phase currents will add to zero in a core-balance current transformer. Current transformers have their own limitations with respect to both low and high currents. 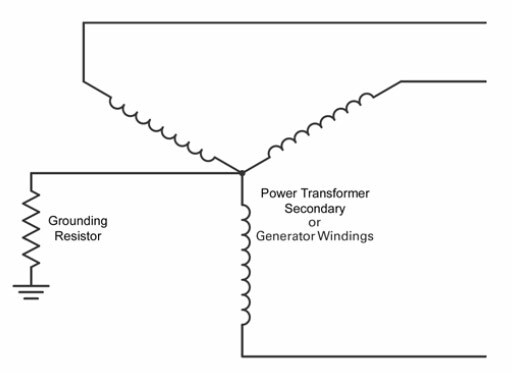 At the low-current end there is a minimum primary current that will give an output, and under some conditions this can make it necessary to use a specialized zero-sequence current transformer. At the high-current end there can be problems with core saturation, with output no longer being proportional to primary current. And even when primary current is not excessive, if the primary conductors are poorly placed, or there are large surge currents, portions of the transformer core can go into saturation, preventing balanced currents from summing properly and producing an output when there is no zero-sequence current. One way to reduce this effect is to use a flux conditioner, which is a magnetically-conductive sleeve that fits in the current transformer's window and reduces local saturation. It's also helpful to center the phase conductors in the current transformer window, and to bundle them ABC, ABC, etc., not AA, BB, CC, etc. Transient currents can also cause a problem: when a motor is started across the line there is no way to predict the part of the AC cycle at which the switch will close; this can cause a momentary DC component that can cause an output from the current transformer. Fortunately this is easily corrected by increasing the ground-fault relay's trip delay, or by using a digital filter to reject the DC component. The output waveform of a frequency inverter is not a pure sine wave and for that reason, contains several harmonic-frequency components (multiples of the fundamental output frequency). Since the reactance of the system capacitance is inversely proportional to frequency, higher order harmonic currents more easily flow through the system capacitance to ground. If capacitance and voltage are balanced, the harmonic currents on all three phases are the same and they will sum to zero and have no effect on ground current. However, the effects of unbalance are magnified at higher frequencies. The third harmonics (180 Hz, etc. when the system is running at 60 Hz), also called the triplen harmonics, are in phase with each other and can create enough ground current to cause a ground-fault trip. This can be dealt with by increasing the trip setting on the ground-fault relay or by using a ground-fault relay with a built-in digital filter that can reject third order harmonic currents. Another problem with frequency inverters is carrier-frequency leakage current. The output of a frequency inverter includes components of the carrier frequency. The effect of capacitive and voltage unbalance are greater at higher frequencies, with current flowing to ground with no fault present. Motors operating at low speeds lose cooling capacity because their shaft-mounted fans lose output at low speed (the amount of air moved by a centrifugal fan varies with the square of the shaft speed). And even motors cooled by separate fans can overheat if their air ducts are clogged with dirt. Motor protection relays can help here, but they have features largely redundant to those offered by the frequency inverter. Fortunately, some of today's ground-fault relays can accept inputs from the temperature sensors (RTDs or PTC thermistors) built into motor windings to provide warning of motor over-temperature at considerably less cost than a motor-protection relay. While it may seem counter-intuitive, a current transformer can be made to measure DC, and in fact current transformers are used in such scientific applications as measuring the beam current in large particle accelerators. In the case of ground-fault relays, the equipment size is measured in inches, rather than feet or miles, but the principle is the same: detection of changes in core saturation caused by DC current. A voltage is applied to the secondary of the current transformer; as the current ramps up according to the law V = -Ldi/dt, the core eventually begins to saturate. The circuitry detects this and reverses the applied voltage, creating a square wave as the system switches back and forth between saturation current levels in both directions. Any DC or low-frequency AC current flowing through the primary will bias the magnetic field in the core in one direction, making the secondary current at which saturation occurs polarity-sensitive. The result is a change in duty cycle of the square wave that can be translated to a measurement of the current in the primary. So far there are no official regulations requiring protection at low frequencies and DC but MSHA has been recommending that users install low-frequency ground-fault protection. Canada has not yet addressed the problem, while Australian authorities are keenly aware of it, and have been looking forward to the development of a solution. A microprocessor-based ground fault relay that uses the technology described above to measure ground currents down to 0 Hz—in fact, it can be powered by DC and used as a DC ground-fault relay. It is most often used with one current transformer (for output frequencies between 0 and 100 Hz), and can do this using the same current transformers as earlier models, which means it can be installed in place of an existing ground-fault relay without replacing the current transformers. Where higher motor frequencies are used or there is a need to measure harmonics and the carrier frequency, a second current transformer can be added to extend coverage to 15 kHz. The unit also provides two adjustable setpoints in the range of 30 to 5,000 mA, one for warning and one to trigger a shutdown, plus three programmable output relays. The relay also has a temperature input that works with a motor's embedded RTD or PTC temperature sensors and can both display frequency inverter temperature and trip on over-temperature. High-resistance-grounded systems have many advantages, but the increasing use of inverters can make it difficult to monitor them for ground faults and other problems. New-technology ground-fault relays can go a long way towards eliminating these problems, and lead to safer and more reliable electrical systems.